New York Rangers backup goaltender Antti Raanta kept cool in his return to the Windy City for Wednesday's season opener against the Chicago Blackhawks. Antti Raanta has cooled down considerably since his heat-of-the-moment comments in the summer put him in hot water. Raanta kept his emotions in check in his return to the Windy City on Wednesday prior to the New York Rangers' season-opening game versus the Chicago Blackhawks. The backup goaltender was traded to the Rangers a mere 12 days after the Blackhawks won the Stanley Cup in June. Raanta reiterated that he was briefly upset after falling behind backup Scott Darling on the depth chart when he told Finnish newspaper Ilta-Sanomat that he was rooting against Chicago in the playoffs. The 26-year-old Raanta also told reporters that he had made peace with having his name left off the Stanley Cup as well. 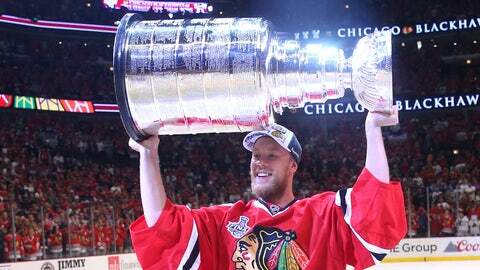 Chicago cited a numbers game for its reason for leaving Raanta's name off the Stanley Cup. The Blackhawks must submit 52 names, with the lone rule for inclusion being a player must appear in 41 of the team's 82 regular-season contests or at least one Stanley Cup final game. Raanta (7-4-1 with two shutouts and a 1.89 goals-against average) played in only 14 contests, but dressed as a backup to either Corey Crawford or Darling in more than the requirement. Raanta did receive quite a consolation prize on Wednesday when Blackhawks vice president Al MacIsaac presented him with a championship ring. The ring has 355 round, pear, marquise and princess-cut diamonds totaling 10.8 carats and is set in 14-karat white gold.